« FORGET CANNES, SOUTH NORWOOD COULD BE THE BEST FILM FESTIVAL. 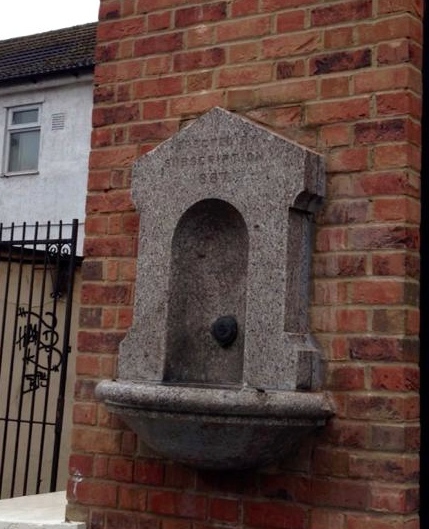 Finally, after great work by John Hickman and People for Portland Road, South Norwood’s own drinking fountain has now been restored, at the bottom of South Norwood Hill. We contacted John Hickman to get some background on this striking piece of South Norwood History. The fountain was erected in 1887 to commemorate and celebrate the golden jubilee of the reign of Queen Victoria. Mr Algernon Coote, about whom we know next to nothing as yet, collected money, in the form of donations, from the people of South Norwood to have the red granite fountain manufactured and erected. The cost of making it was around £24, and another £10 was required to have it installed and linked to the water mains. We do know that Algernon Coote was associated with London City Mission in Portland Road, that he was an ardent temperance supporter and had left South Norwood for ??? ?, by 1890. There was a lower dog drinking trough as well, but unfortunately that is lost. A little over a decade ago the wall that the fountain stood in (adjacent to the present site) was demolished to create an extra car parking space. While this was going on, the late Hugh Byford (he died in 2005) having observed this act of vandalism, phoned Croydon Council who collected the fountain, put it on a lorry and drove away. In 2010 I was going through Hugh Byford’s papers, now on Croydon Archives, and came across correspondence that led to the discovery of the whereabouts of the fountain. Fortunately another friend had taken a photograph of the fountain before it was knocked down – so we knew what it looked like. Carol Clapperton later confirmed it was in a Croydon Depot. I think you know the rest. Regards to friends at South Norwood Tourist Board.